Parsnip is a hardy, biennial, strongly-scented plant (Pastinaca sativa), which is a member of the parsley family (Apiaceae or Umbelliferae), which also includes the carrot. The term parsnip also applies to the long, edible, white taproot of this plant, which is eaten as a vegetable. Parsnips resemble carrots, but are paler and have a stronger flavor. The parsnip is one of a vast array of food providing plants that humans have a relationship with. The relationship between humans and the environment is enhanced by the fact that the best nutrition involves consumption of diverse foods. In addition, the parsnips unique, sweet flavor adds to the human enjoyment of nature. Utilizing their creativity, human beings have learned to cultivate this root vegetable and to prepare it in many ways. Pastinaca sativa is a member of the Apiaceae or Umbelliferae family (both names are allowed by the International Code of Botanical Nomenclature). This family comprises unusually aromatic plants with hollow stems, including the cumin, parsley, carrot, dill, caraway, fennel, and other relatives. The family also includes some highly toxic plants, such as hemlock. Apiaceae is a large family with about 300 genera and more than 3,000 species. The earlier name Umbelliferae derives from the inflorescence being in the form of a compound "umbel." The small flowers are radially symmetrical with 5 small sepals, 5 petals, and 5 stamens. Pastinaca sativa is an biennial plant that is strongly-scented and grows to over 1.5 meters in height. The edible taproot is fleshy, long (can be over 80 centimeters at times), and white. During a period of low temperature, such as the first frost of the year, after growing in the summer, much of the starch in the root is converted to sugar, yielding a distinctive, sweet flavor. Being hardy, the taproot can remain in the ground during the winter, enduring the freezing of the soil. Parsnips are not grown in warm climates, since frost is necessary to develop their flavor. Like carrots, which they resemble, parsnips are native to Eurasia and have been eaten there since ancient times. Zohary and Hopf (2000) note that the archaeological evidence for the cultivation of the parsnip is "still rather limited," and that Greek and Roman literary sources are a major source about its early use. They warn, however, that "there are some difficulties in distinguishing between parsnip and carrot in classical writings since both vegetables seem to have been sometimes called pastinaca, yet each vegetable appears to be well under cultivation in Roman times." The parsnip was brought to the United States from Europe in the early 1600s. It occupied the place commonly reserved for potatoes in contemporary dishes. The parsnip is a favorite with gardeners in areas with short growing seasons. Sandy, loamy soil is preferred; silty, clay, and rocky soils are unsuitable as they produce short forked roots. The parsnip is richer in vitamins and minerals than its close relative, the carrot. It is particularly rich in potassium with 600 milligrams (mg) per 100 grams (g). The parsnip is also a good source of dietary fiber and folate, and is a source of vitamin C. A 100g portion of parsnip contains 55 calories (230 kJ) energy. Parsnips can be boiled, baked, steamed, or used in stews, soups, and casseroles. They are often boiled and mashed like potatoes (Herbst 2001). In some cases, the parsnip is boiled and the solid portions are removed from the soup or stew, leaving behind a more subtle flavor than the whole root and contributing starch to thicken the dish. Roasted parsnip is considered an essential part of Christmas dinner in some parts of the English speaking world and, in the north of England, frequently features alongside roast potatoes in the traditional Sunday Roast. 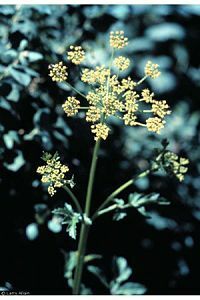 When picking wild vegetables, it is easy to mistake poison hemlock (Conium maculatum) for parsnip, with deadly results. Water hemlock is another plant that smells and looks like parsnips. Consumption of moderate quantities of this vegetable by man can result in the intake of appreciable amounts of psoralens. Consumption of 0.1 kg of parsnip root could expose an individual to 4 to 5 mg of total psoralens, an amount that might be expected to cause some physiological effects under certain circumstances. Ivie, G. W., D. L. Holt, and M. C. Ivey. 1981. Natural toxicants in human foods: Psoralens in raw and cooked parsnip root. Science 213: 909-910. Zohary, D., and M. Hopf. 2000. Domestication of Plants in the Old World, third edition. Oxford: University Press. All links retrieved January 15, 2019. Pastinaca sativa profile on the USDA plants database. Pastinaca sativa profile on missouriplants.com. This page was last modified on 15 January 2019, at 17:03.